MoAb-2 from Biosensis is selective for oligomeric Aß (40/42, (o) Aß(40/42. There is no cross-reactivity with amyloid precursor protein. Compare results from immunehistology with data of liquid samples screened in an ELISA with the same antibody, MoAb 2 from Biosensis. This allows retrospective screening and will assist drug development. See references below for more details about the antibody. 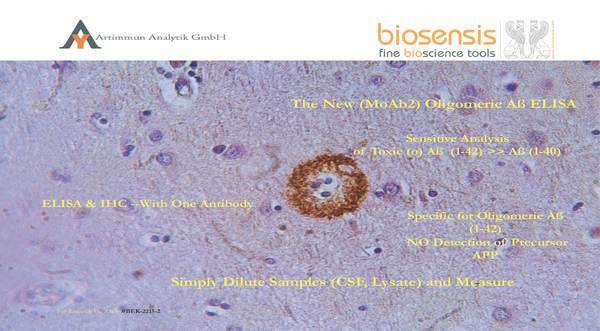 Biosensis human, mouse and rat ELISAs for soluble antigen monitoring are available in 2 sizes, 1x96 and 2x96 wells. Short description of the 2 plate assays can be accessed via a link in the table below. We offer attractive unit prices for orders with 2 kits or more. Please ask for your updated quote.